HONORABLE MENTION: Auburn 6-3, Bellport 8-2, Connetquot 7-2, Curtis-PSAL 8-5, DeWitt Clinton-PSAL 9-2, Corning 9-2, Deer Park 6-3, East Meadow 8-2, Elmira 7-3, Farmingdale 7-2, William Floyd 5-3, Flushing-PSAL 8-4, Half Hollow Hills West 9-2, Hyde Park Roosevelt 6-2, MacArthur 6-3, Mahopac 6-3, Mepham 6-3, Minisink Valley 7-2, Msgr. 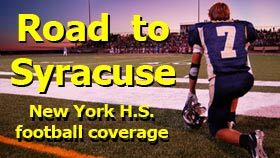 Farrell-CHSFL 6-4, Patchogue-Medford 6-5, Riverhead 7-3, Sachem East 8-2, Scarsdale 7-2, Smithtown East 6-3, Syracuse CBA 5-4, Syracuse Corcoran 6-2, St. Anthony-CHSFL 7-4, Tottenville-PSAL 8-3, Warwick Valley 6-3, Webster Thomas 6-3. HONORABLE MENTION: Amsterdam 6-3, Bayport-Blue Point 7-3, Bayside-PSAL 9-3, Beacon 6-3, Bethpage 6-4, Bishop Kellenberg Memorial 8-2, Bishop Maginn 7-2, Brockport 6-3, Carthage 6-3, Christopher Columbus-PSAL 8-4, East Syracuse Minoa 6-4, Fordham Prep-CHSFL 8-3, Hamburg 6-3, Lafayette-PSAL 8-3, Port Jervis 6-4, Scotia-Glenville 6-3, Sleepy Hollow 6-3, Wallkill 6-3, Westhampton 6-3, Whitesboro 7-2, Williamsville South 7-2.